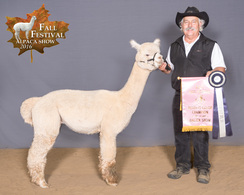 Premonitions Sire, Snowmass Sub-Zero, lineage has a strong prepotent tendency towards producing consistently fine fleece, with low CV, high curve, and remains bright throughout the life of the alpaca. RED GRANITE'S BAD BOY IS ONE OF OUR TOP PREMONITION SON'S. 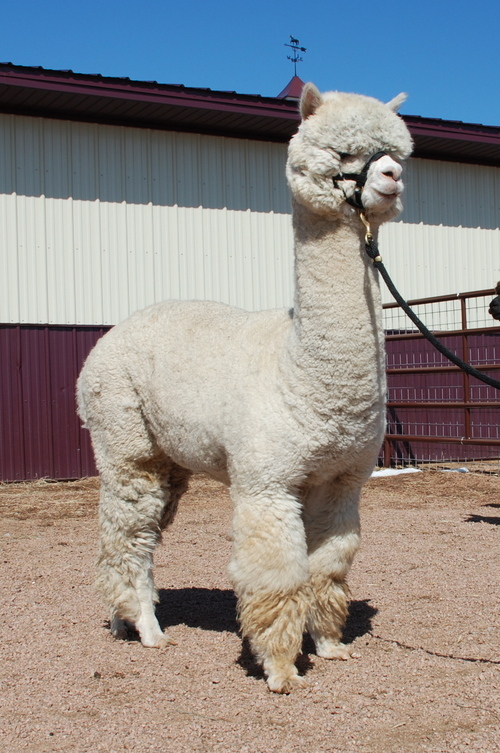 HIS PEDIGREE INCLUDES SON OF THE BEST WHITE IMPORTS SUCH AS 4PERUVIAN LEGACY, PERUVIAN HEMINGWAY, 6PERUVAIN MONARCH, AND 6PERUVAIN ELITE. BAD BOY IS ALSO THE GRANDSON OF SNOWMASS SUB-ZERO AND GRANDSON OF SNOWMASS MATRIX. WHEN YOU PUT AL THESE INCREDIBLE WHITES\BEIGES TOGETHER YOU GET A BEAUTIFUL MALE SUCH AS BAD BOY. BAD BOYS CRIA'S ARE OUTSTANDING! 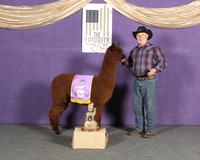 HIS CRIA'S ARE CARRYING SUPER FINE, DENSE, AND SUPER SOFT FLEECE'S.